Today will be the 4th time I’ve made this soup since Fall arrived. Can’t get enough of it!! It’s incredibly flavorful and guilt free at 380 calories per serving. Sometimes I puree it completely and sometimes I leave some cauliflower bits in the soup. It’s perfect either way. The vinegar on top should not be skipped :). Preheat oven to 450 F. Slice the cauliflower into large slices and spread in a single layer on a baking sheet. Season cauliflower with cumin, smoked paprika, and liberal amounts of salt, pepper, and olive oil. Roast in the oven for 30 minutes. Set aside once cooked. Sauté the onion in 2 tablespoons of olive oil over medium-medium high heat until tender and translucent and beginning to brown. Add garlic and pepper flakes and sauté until fragrant, about 30 seconds. Add cauliflower and stock and bring to a boil, then reduce heat and simmer about an hour. Remove from heat and purée. In a skillet, brown sliced kielbasa and set aside. Return the puréed soup to low heat. 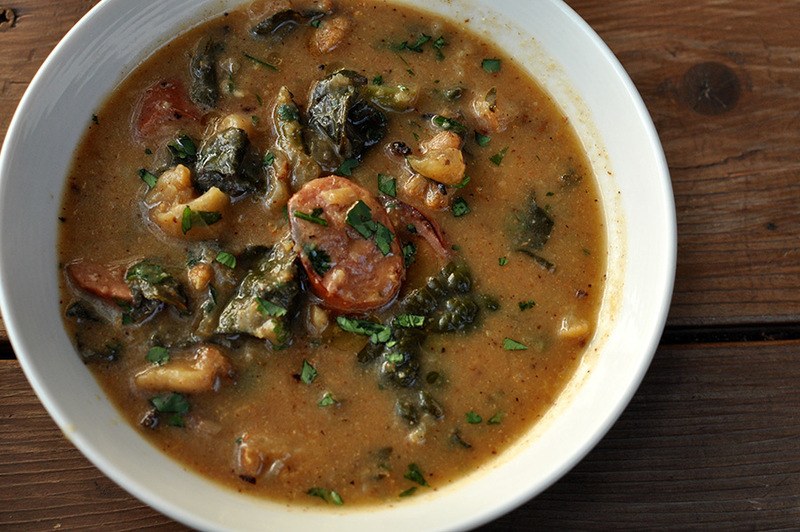 Add the kale and sausage and simmer another 10 – 15 minutes until the greens soften a bit. Remove from heat. Stir in the cilantro and the lemon juice and season to taste with salt and pepper. Serve with a sprinkle of smoked paprika, drizzle of olive oil & splash of sherry vinegar (optional). I can never get enough of soups, either! The cauliflower looks divine. Thanks for sharing!